Another option for turkey lovers. Our Bone In, Skin On Turkey Breast is perfect for smaller gatherings. Plump and juicy, our turkeys are raised the old-world way with 100% organic feed and the freedom to range in the out-of-doors. 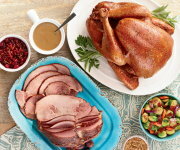 This means that you're assured a turkey free of antibiotics, synthetic hormones, and pesticides. Along with the full turkey breast, this cut includes the keel, ribs and backbone...great for making turkey soup! This is a variable weight product that will range from 4 -6 pounds. Very pleased with the bone-in turkey breasts. Slow cooked it. The aroma in the kitchen was so overpowering that we decided to have part of it for dinner that night instead of slicing it all up in the meat slicer for sandwiches. I'll do it again in a heart beat. The price is high, but so is the quality. My husband is a stroke survivor. He requested turkey (we only eat organic) . As a 24/7 caregiver, I do most of my shopping online. 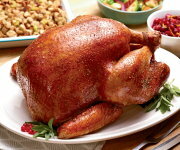 I ordered the organic turkey from Organic Prairie, a favorite line of ours for years. It arrived quickly and husband loved it ! I'm so happy that I ordered this item, it was a great meal - several meals actually, plus soup. The best tasting turkey that we've ever had. Loved the home delivery and not having to hunt at the market. I would order again, and look forward to trying other items. It was so worth the expense - a no brainer! 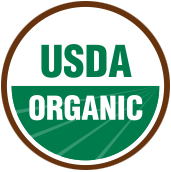 All of my meat products come from Organic Prairie. I normally buy my organic turkey locally. However, my husband really like the OP boneless chicken so I decided I would order the turkey breast from OP this year. Oh my gosh...absolutely the best turkey breast I have ever prepared. I cooked it on 325 degrees until it reached 162 degrees. I left it tented with aluminum foil for 15 minutes to increase the temperature to 165+. This turkey breast had fabulous taste and was incredibly moist. Will definitely order again!! Organic Prairie meats are the best period. The breast was actually 6.42 pounds which was a pleasant surprise. You usually never get more than you pay for. As for the organic bone in turkey breast it was wonderful. Shipping was on time although i found it to be pretty expensive(14.00) . I brined the breast for 24 hours and it was very moist and flavorful. It was the talk of the dining room table on Thanksgiving. Bottom line, I would order it again. Very good. The organic bone in and skin on turkey breast for Thanksgiving was absolutely the best and we will be reordering turkey and other items from Organic Prairie. We used Sandra Lee Thanksgiving turkey preparations, which is a great match for this turkey. Thank you Organic Prairie! Arrived in good time well packed. Flavor was excellent! Just the right size for a small family. So hard to find this size organic turkey breast with bones still in. Thank You! The turkey was tasty and very fresh. It came very well packaged. My family was very happy with it. Thank you for the juiciest turkey ever. I had some left overs ... so I boiled the bones and made broth for turkey soup. Thank you to the farmers who are making a difference in the health of the animals and of course the wellness of man kind. This was my 1st order from your website. Very good quality and wonderful flavor. The order was delivered right on requested schedule. Thank you!! Handling was easier, meat was excellent, great timing on shipping. I missed the dark meat though and I had to buy some extra pieces to roast with it but that's a personal preference. Also missed the bones for stock. Very nice size for a small family or everyday use. Very tender and tastes wonderful! Bought this last year for thanksgiving and enjoyed so I purchased another for this year. 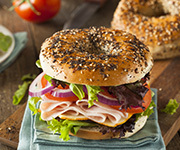 You can truly taste the difference from commercial products. 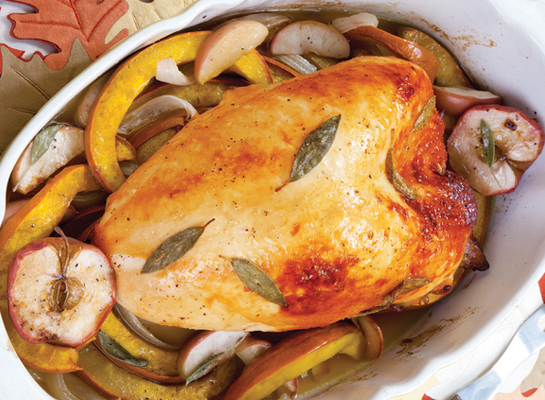 If you're a white meat lover as we are, this turkey is absolute perfection. Nice to look at, easy to cook, and juicier than any turkey we've ever had. We will definitely buy again!!! All meat purchases so far are excellent. I loved them and plan to buy more of the same plus some other things. This was our first order with Organic Prairie. The turkey breast arrived when promised. It was for thanksgiving, so I made sure I ordered it in time. It arrived on Nov 18, plenty of time. It was juicy, tender and delicious with our thanksgiving feast. I'll definitely order other items from them soon! Our turkey breast was absolutely delicious! There is a definite difference in the taste of organic versus ordinary. The flavor is excellent. I have enjoyed roasting whole chickens for so long I wasn't sure about the turkey breast. I am happy to say this bird breast was a huge hit for Thanksgiving with folks!! We enjoyed leftover and I made soup with the carcass!! Thanks to Organic Prarie!!! I brined the turkey breast for 24 hours before cooking. The meat was really moist and so flavorful. Best turkey I have ever eaten. Delicious terrific turkey! Arrived perfectly packaged and frozen solid. Very impressed with this high-quality turkey. Healthy & organic & more. Thank you! 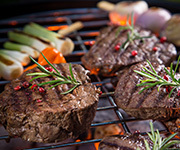 Organic Prairie consistently provides the highest quality meats! Whenever we make an O.P. purchase, we know that we are going to be very satisfied, and our expectations are always exceeded. Your products deserve a 10 out of 5 rating!! The organic turkey breast was excellent. We are planning to order one each month. 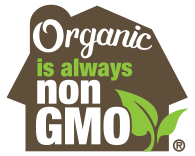 We are a family of three and prefer organic. We no longer have a local organic turkey farmer/supply source. I went online and found Organic Prairie. The order arrived timely and the packaging was excellent. I was delighted when I took the large turkey breast out of the wrap and saw the size and quality! It cooked up so easily for our Thanksgiving Dinner. Now on the day after Thanksgiving the meat is as tasty as day one - no funky "day 2" turkey taste. Will be ordering online from Organic Prairie! Thank you for farming! Bone in, skin on turkey breast arrived on time and completely frozen. Thawed in fridge 1 1/2 days. Roasted as per Ina Garten but extended cook time (maybe not completely defrosted?) by about 10 + minutes. Very good taste and texture. Served 7 with enough left for soup. Organic Prairie never disappoints us. We usually order the whole turkey/ ham combo, but we no longer have extra freezer space, so ordered this instead. It arrived second day shipping and still frozen solid. We absolutely enjoyed the turkey on Thanksgiving. I made wonderful gravy from the drippings and the bones are in the freezer for bone broth later. We are always so pleased with our purchases from Organic Valley and trust them to provide excellent quality meats and poultry. We had a great experience ordering a bone-in turkey breast from Organic Prairie - it arrived when expected, the packaging was amazing (the dry ice was still in great shape and the meat nicely frozen), and when the time came to roast it - it was delicious! We will definitely be ordering from you again.